Afflictions of the respiratory system include irritation and infection of the ears, nose and throat. 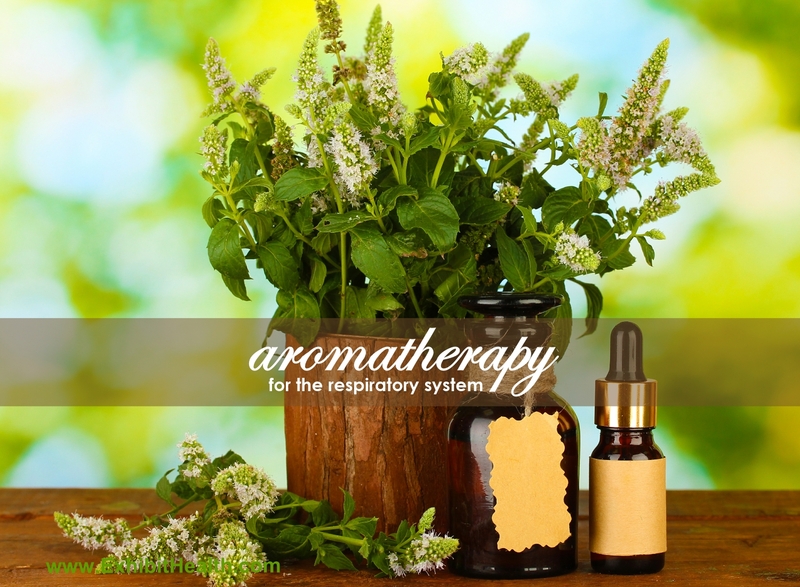 Respiratory problems also may involve congestion, which can be decreased by inhaling rosemary (especially the verbenone type), hyssop (use var. decumbens only), tea tree, eucalyptus, lavender or peppermint. Cypress helps dry up a persistent runny nose, and peppermint, tea tree and eucalyptus reduce sinus infection. Anise and cypress help reduce coughing. Ninety percent of respiratory ailments are caused by viruses. Oils of thyme, rosemary, peppermint, ravensara, tea tree, eucalyptus, bergamot, black pepper, melissa and hyssop inhibit most flu viruses. Lemon and eucalyptus oils are effective against bacteria that cause staph, strep and pneumonia infections. A 2-percent dilution makes an effective antiseptic gargle or vapor steam. Steam treatment carries essential oils directly to sinuses and lungs, and provides warm, moist air to help open nasal and bronchial passages. To do a steam, boil a pan of water, turn off the heat, cool 1 minute, add 3-6 drops of essential oils to the water, and use a towel to corral the steam around your head as you breathe deeply. Essential oils can also be used in many humidifiers, or as an ingredient in steamy hot bath water. Place a few pieces of rock salt in a vial and add the oils. The salt will quickly absorb the oil. Inhale. 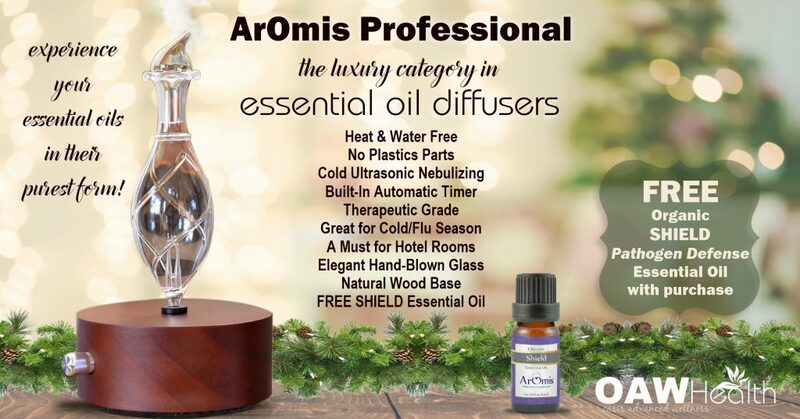 An aromatic diffuser-a glass piece (often hand-blown) connected to a small electrical compressor- disinfects the atmosphere by releasing droplets of essential oil as a cool, fine mist. One advantage to using a diffuser is that the essential oil vapor can be directed into the nose, throat or even ear passages. It can be turned on in a sickroom for 10 to 15 minutes every hour to clear airborne bacteria. Do not use thick oils such as vetiver, sandalwood, vanilla, myrrh and benzoin in a diffuser unless they are diluted with a thin oil-such as the citruses, eucalyptus or rosemary-or mixed with alcohol. If oils sit too long in a diffuser, they oxidize and thicken. Also, expressed citrus oils often contain sediment that may clog a diffuser. To clean or unclog it, soak the glass unit in alcohol and unplug the opening with a pin or toothpick. Rinse and air dry. Diluted essential oils can also be used as a throat spray through “nebulization.” A nebulizer sprayer, with its long spout that reaches to the back of the throat, used to be a standard item in the home medicine cabinet. A perfume atomizer or spray bottle will work just as well. If you don’t have a diffuser, simply combine water and essential oils in a spray bottle. Studies show that a two-percent dilution of eucalyptus oil kills 70 percent of airborne staph bacteria. Generations of Europeans, especially singers, have gargled sage, thyme or marjoram tea sweetened with honey to relieve laryngitis and tonsillitis. A few drops of essential oils diluted in two ounces of water may also do the trick. In case of sore throat, gargle frequently, at least every half-hour. Shake well to disperse the oils before each use. For a gargle, half a teaspoon of salt may be dissolved into the solution. For lung congestion a salve or a massage oil containing essential oils can be rubbed over the chest, back and throat. The oils will be absorbed through the skin and lungs as the vapor is inhaled. Place a flannel fabric on the chest after rubbing in the oil to increase warmth. Commercial “vapor balms” still use derivatives of essential oils (or their synthetic-oil counterparts), such as thymol from thyme and menthol from mint, in a petroleum ointment base. Natural alternatives are also sold in natural-food stores. Melt beeswax into olive oil over very low heat. Cool a bit, add essential oils and stir. (Be sure to keep your face away from the oils as you stir them in.) Allow to harden. Store at room temperature. Poultices are an age-old remedy for chest congestion. A ginger or onion compress on the chest breaks up lung congestion and makes breathing easier. Onions also help curb asthma and allergic reactions. Lightly cook together in a little water until soft. Cool slightly, mash and apply to the chest while still warm. Cover with a soft cloth. Herbal Adjuncts-Herbs that loosen mucus from the lungs include elecampane, horehound and mullein. Respiratory relaxants, such as wild cherry bark and wild lettuce, are used in cases of extreme spasmodic coughing. Demulcent herbs, which soothe inflamed mucous membranes, include flaxseed, marshmallow root and licorice. Use these herbs in a tea, tincture, pills or syrup.